As with all of our plans, you are building at your own risk and you should have a firm understanding of building in general before you attempt many of our plans (some are easy as pie and perfect for beginners). 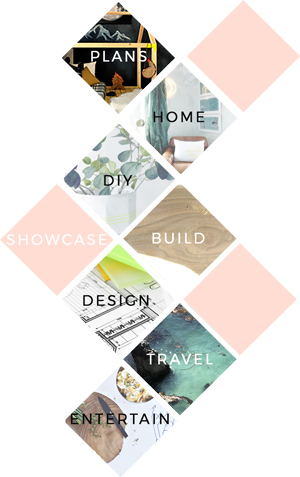 With that, go forth, have fun, take lots of pictures and share them in a showcase on the site or on social media with the hashtag #builtTDCtuff and we will share our faves! 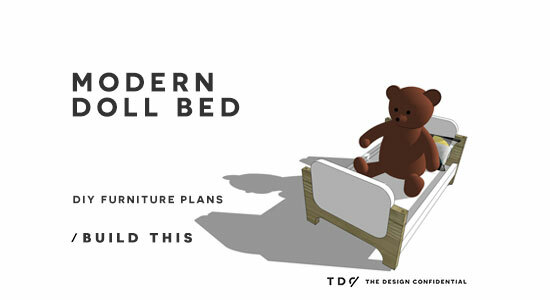 Be sure to tag @thedesignconfidential on Instagram / FB and @thedesconf on Twitter / Pinterest. Don’t forget… for all of our newer plans, clicking on the images will let them expand to enormous sizes with much greater clarity. The older plans may need updating so please let us know if you need one fixed! Cut the pieces for the Headboard and Footboard. Using your jigsaw, cut out the 1-1/2” rounded inner corners. Cut the pieces for the Headboard and Footboard Inserts. 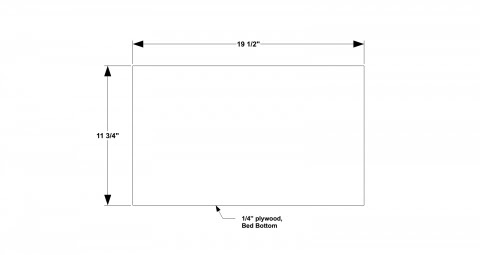 Using your jigsaw, cut out the 1-1/2” rounded outer corners. 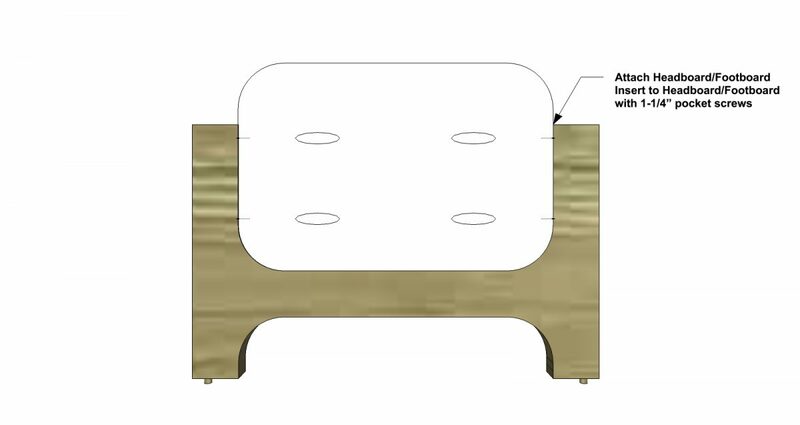 With the Kreg jig set for 3/4” material, drill pocket holes in each end of the Headboard and Footboard Inserts. 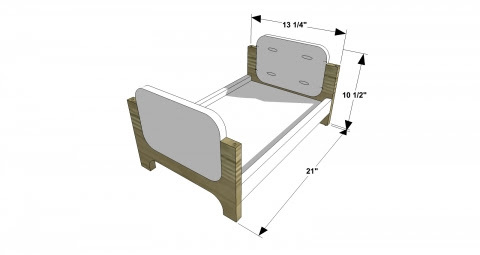 Drop one insert into each Headboard and Footboard. If the Inserts do not fit exactly, use a sander to shape. Assemble as shown with glue and 1-1/4” pocket screws. 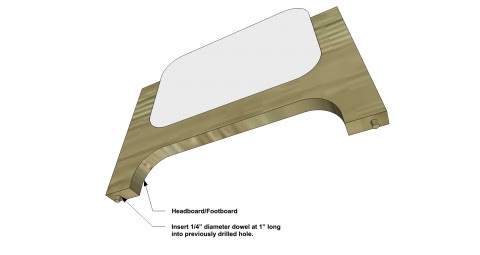 Use veneer edging to cover exposed edges of the plywood if desired. 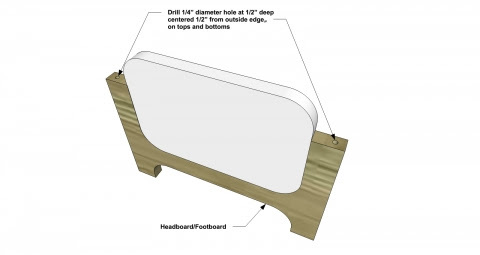 At the tops and bottoms of the “legs” on each Headboard and Footboard, drill a 1/2” deep hole with a 1/4” drill bit as shown. You may need to wiggle the drill bit as you drill the hole to make it just a tiny bit larger than the 1/4” diameter. 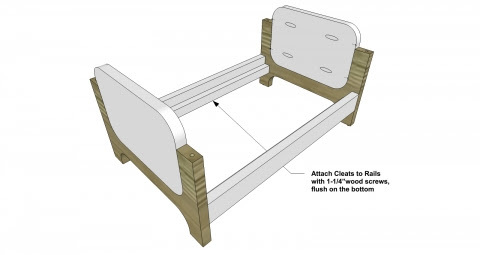 This will allow for easier installation of the Leg Dowels at the bottoms of the Headboard and Footboard and for stacking the doll bed as bunk beds. Cut the pieces for the Leg Dowels. 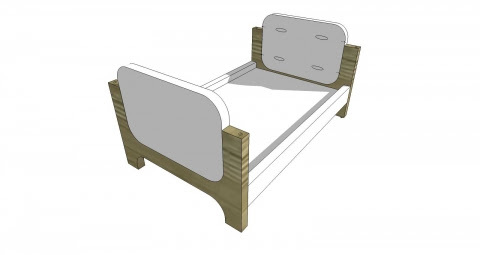 Drop a small amount of wood glue into the holes drilled at the bottoms of the Headboard and Footboard. Insert a 1” Leg Dowel into each hole. Make sure to clean any extra glue at the base of the dowels after they are inserted into the holes. Cut the pieces for the Side Rails. 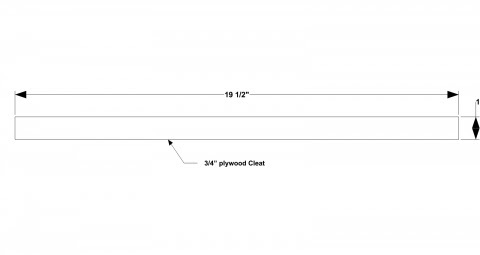 With the Kreg jig set for 3/4” material, drill pocket holes at each end of the Side Rails. 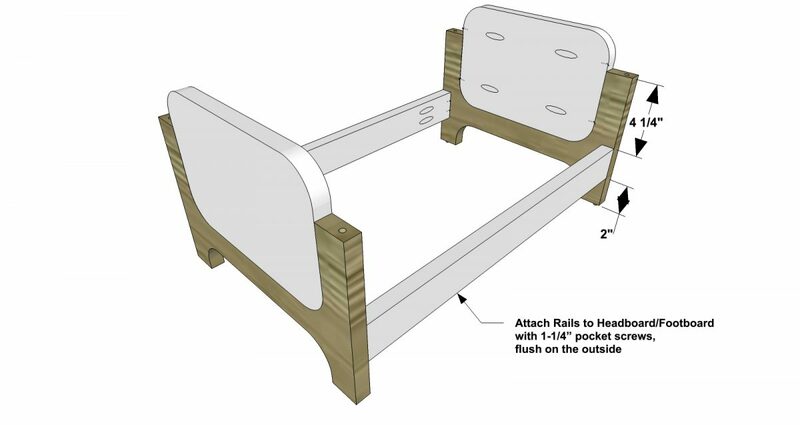 Position the Side Rails on the Headboard and Footboard as shown, flush on the outside of the Headboard and Footboards. Assemble with glue and 1-1/4” pocket screws. 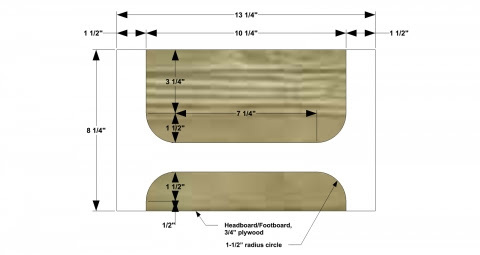 Use veneer edging to cover exposed edges of the plywood if desired. Cut the pieces for the Cleats. 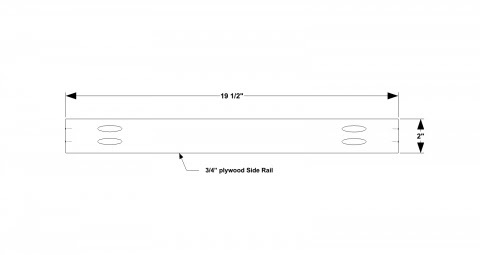 Attach to the inside of the Side Rails, flush on the bottom with the Side Rails with 1-1/4” wood screws. Cut the piece for the Bed Bottom. 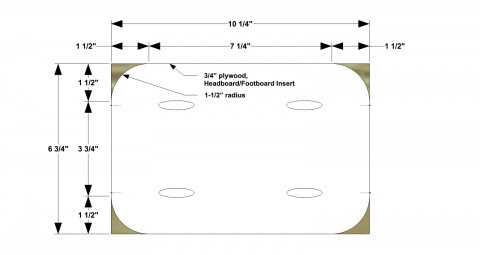 Place the Bed Bottom on top of the Cleats as shown.